Marine, Yacht & Ship Pipe ID Tapes - ISO 14726- Campbell International Specialist Tapes. 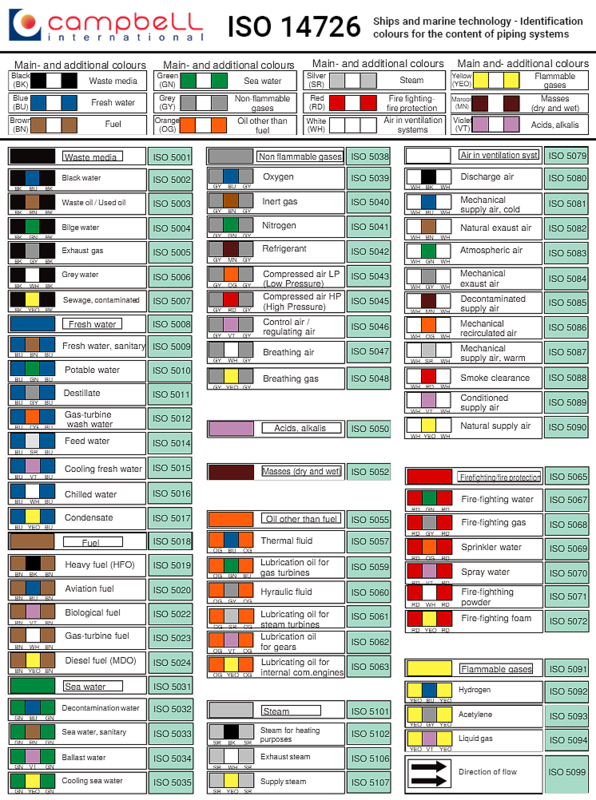 Below is a chart of the official ISO 14726 marine pipework identification tape colours for use in oil rigs, ships, boats, yachts and all marine buildings. Order online, call +44(0)1732 773364 or Contact Us with your requirements. Tape widths: Tricolour; 90mm. Plain colour; 60mm. Arrows; 48/50mm. In 2014, the equivalent British Standard, BS1710 for onshore pipeline identification ceased to cover the marine environment, leaving ISO 14726 as the leading standard. In December 2017, the International Maritime Organisation (IMO) passed resolution A.1116(30) to implement ISO 24409-2 for escape route signage and equipment location for all new vessels from 1 January 2019. Similar IMO and ISO signage may co-exist on existing marine installations and ships. However, this begins the move towards ISO regulation for all marine and offshore safety signage. Campbells Marine: Pipeline Tape and Safety Signage; as these and other ongoing changes come through, let Campbells help to keep you up to date. 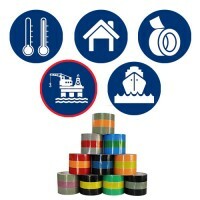 See our current stock of ISO compliant marine tapes below. Contact Us to order any non-stock items and signs. Marine Pipe Tape, Boat Pipe Tape, Ship Pipe Tape, Oil Rig Pipe Tape, Port Pipe Tape, Yacht Pipe Tape, Pipeline ID Tape, Pipeline Marking Tape, Pipe Marker Tape, Pipe Marking Tape, Pipeline Marker Tape, Pipe Labelling, Pipeline Labelling, Pipeline Labelling Tape, Pipeline Label Tape, Pipe Label, Pipe Labels, Pipeline Label, Pipeline Labels... Quality, standard compliant tape! ISO 5001 - Waste MediaSize: 60mm x 33m. Colour: Black - 00E53	Technical specification: White rigid PVC coated one side with a transparent resin rubber adhesive laminated with a 30 micron transparent polypropylene for environmental protection. Recommended for internal use only. British St.. Size: 90mm x 33m	Colour: Banded Black/Brown/Black	Technical specification: White rigid PVC coated one side with a transparent resin rubber adhesive laminated with a 30 micron transparent polypropylene for environmental protection. Recommended for internal use only. .. Size: 90mm x 33m Colour: Banded Black/Green/Black Technical specification: White rigid PVC coated one side with a transparent resin rubber adhesive laminated with a 30 micron transparent polypropylene for environmental protection. Recommended for internal use only. .. Size: 90mm x 33m	Colour: Banded Black/Yellow/Black	Technical specification: White rigid PVC coated one side with a transparent resin rubber adhesive laminated with a 30 micron transparent polypropylene for environmental protection. Recommended for internal use only. ..
ISO 5008 - Fresh WaterSize: 60mm x 33m	Colour: Auxillary Blue - 18E53	Technical specification: White rigid PVC coated one side with a transparent resin rubber adhesive laminated with a 30 micron transparent polypropylene for environmental protection. British Standards: BS 1710:1984, BS 1710:2..
ISO 5031 - Sea WaterSize: 60mm x 33m	Colour: Green Emerald 14E53	Technical specification: White rigid PVC coated one side with a transparent resin rubber adhesive laminated with a 30 micron transparent polypropylene for environmental protection. Recommended for internal use only. British Stan..